When riding on a wet road, what is usually the most slippery part? When riding on a wet road, what is usually the most slippery part? A. The centre of the lane. B. The right wheel track. C. The left wheel track. When you are riding normally in dry weather then you will be in the centre or centre-left of your lane. Be aware, though, that if it is raining the centre of the lane can be very slippery at first because it will have a layer of grime and oil which won’t get worn off quickly by other vehicles driving over it. If it has been raining for a while and a lot of surface water has built up, there can be more water in two lines on the road where heavy vehicles and cars drive. This is because of compression of the ground underneath the tarmac leading to a small ‘crown’ in the middle of the lane. If deep water is forming it increases your chances of aquaplaning. Don’t ride on the far left of the lane because this is where the kind of debris that will easily puncture your tyre will get swept. It also is more likely to have loose stones or dirt that will be more slippery. Remember that you can always adjust your position based on the vehicles around you. For example, you will stay in the centre or centre-left of your lane when driving with vehicles coming towards you but if you are passing a line of parked cars it’s safer to ride slightly closer to the centre line in case someone opens a car door in front of you, or pulls out from a parking space (riding closer to the centre line makes you more visible to them). However, if there’s a large vehicle coming towards you then you can always give up a little bit of position temporarily until it has passed you. When you are being overtaken, maintain your position in the centre or centre-left of your lane but be aware that spray and buffering from heavy vehicles could be a problem for you. The wind shadow from a heavy vehicle overtaking could also cause a problem as it clears you as you will be sheltered and then could get hit with a crosswind coupled with the turbulence from the vehicle itself. Unless it’s wet, you should be in the centre to centre-right of the lane you are overtaking in. 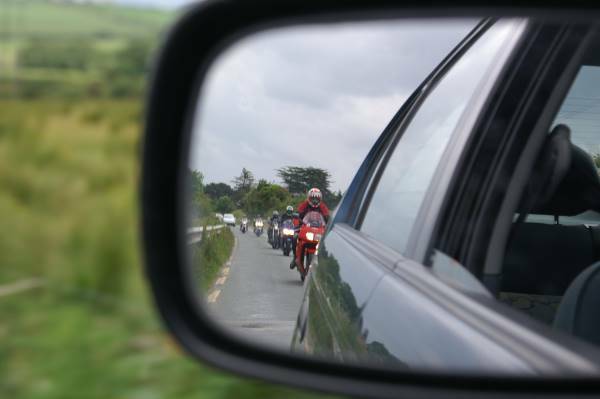 Be mindful that you need to make yourself as visible as possible to the vehicle you are overtaking. You can warn them by giving a very quick flash of your high-beam headlight before you start, then making sure that you execute the overtaking manoeuvre quickly and safely, but without exceeding the speed limit. Be aware that if the vehicle ahead of you is following another vehicle that it could pull out and overtake without seeing you. See this article for how to read other drivers’ intentions. 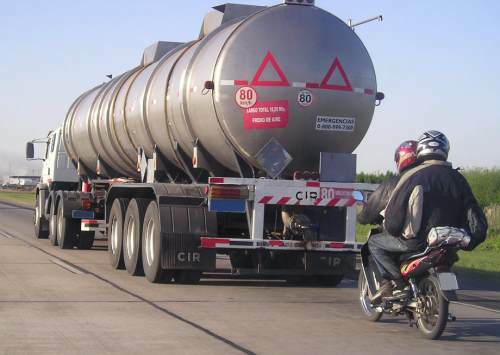 The motorbike above is following way too close to the truck – it would be impossible for the rider to see ahead of the truck and as he’s carrying a pillion passenger, the bike will take much longer to stop. The riders might be saving fuel by getting pulled along in the slipstream, but they’re risking hitting the back of the truck if it brakes hard. By scanning up the road ahead you’ll be able to anticipate any problems that might occur. You should also pay attention to the type of car that you are following: a sports car will be able to stop much more quickly than a regular car, and probably more quickly than your bike, especially if it’s wet, so give yourself more of a buffer. If other vehicles are following you closely, drop back further so that it reduces the risk of them running in to the back of you. Slow in, fast out is the best way to tackle a corner. Adjust your speed so that you can stop in the distance of clear road you can see in front of you on your side of the road – this is called your Limit Point of Vision (LPOV), and is where the left and right sides of the road appear to meet. The LPOV moves in relation to your road position and the angle of the corner. Shallower corner angles give you an LPOV that’s further away, and the wider you are in the corner, the further you can see, too. Watch out for hazards that would be slippery for bikes such as drain covers, road markings, potholes and gravel in the corner (particularly on the inside where it can get dragged onto the road by other vehicles). Look out also for adverse camber or a road with a high crown that turns to the right because it will make it much easier for you to hit your foot peg on the road. When you are approaching a corner the best line to take is the one where you can see the furthest through the corner. Therefore if you are approaching a right-hand bend you will need to position yourself on the left-hand side of the road. Brake in a straight line then come off the brakes before you turn in and apply a small amount of throttle to maintain your speed. This gives your bike the best balance. If you are going more than about 25kph then you will need to give positive input (countersteering) to start steering. Stay a little wide – you don’t want to be clipping the apex of the corner because you can’t see through the turn as well. As you spot the exit of the turn, straighten up and aim to end up in the middle of your lane to give yourself some leeway. With a left-hand bend you will approach in the right-hand side of your lane. The rider above is getting ready to brake for a left-hand corner and is moving right in the lane. You may have to give up some position if there are vehicles coming towards you. Again, adopt the approach that you want to see as far through the corner as possible. You should be roughly in the middle of the lane at the apex of the corner. If you are on the apex then you can’t see as far around. 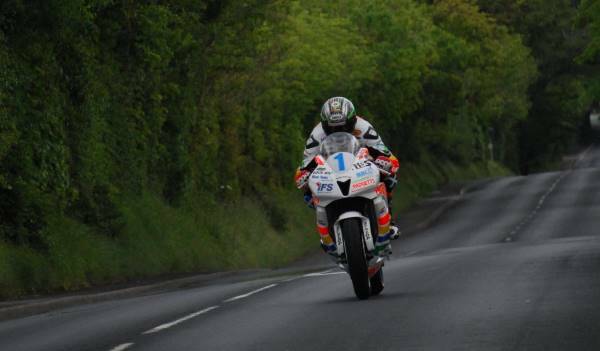 Remember that most crashes on corners are because the rider entered the corner too fast.